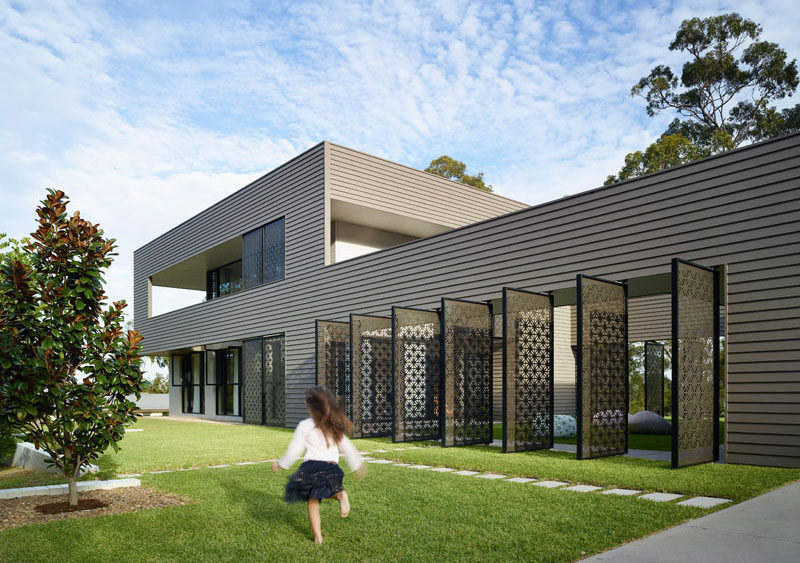 Jamison Architects have designed the ‘Bird House’ on the Gold Coast in Queensland, Australia. 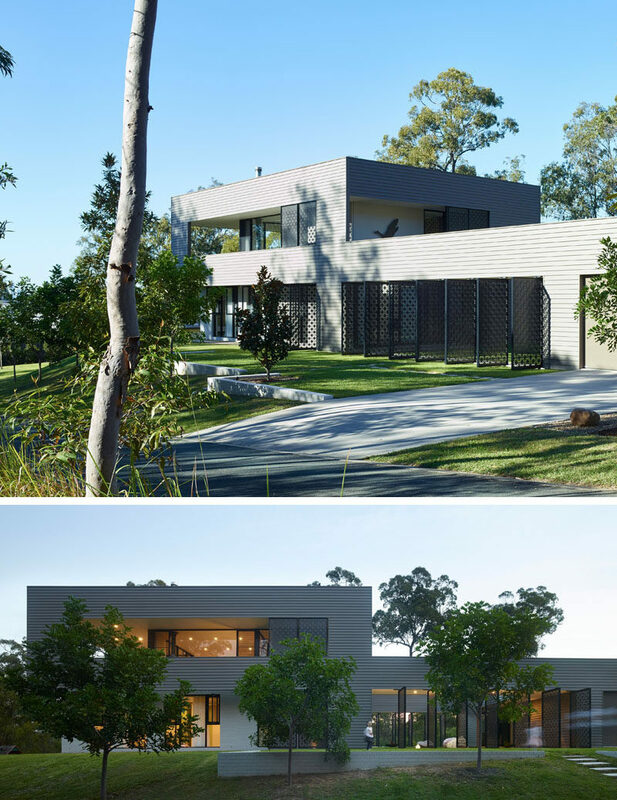 This contemporary home was designed to maximize the abundance of nature that surrounds it, like the bush and tall gum trees. 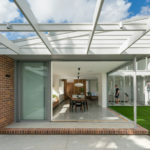 The home consists of two pavilions with horizontal exterior siding, that are connected by an inner courtyard with decorative laser-cut screens . A landscaped garden with a small path leads to a courtyard that’s enclosed by the screens, that can pivot to enable the courtyard to be hidden when needed. 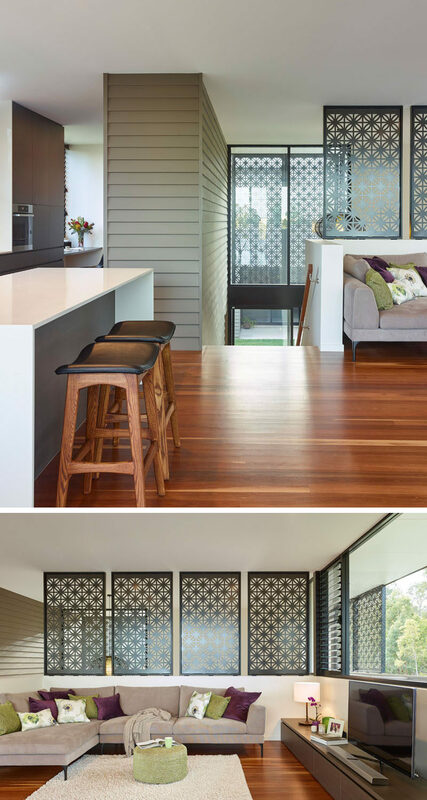 The laser-cut screens have a repetitive pattern and provide a unique experience for someone who is entering the courtyard, the heart of the home. By day, the courtyard offers shade and filtered light, and by night, everyone can gather in the courtyard for bonfires and stargazing. On the wall above, the flying ducks artwork can be removed to allow for a private outdoor movie screening. Heading inside, the exterior siding guides you up the stairs from the courtyard, where you arrive to an open floor plan. 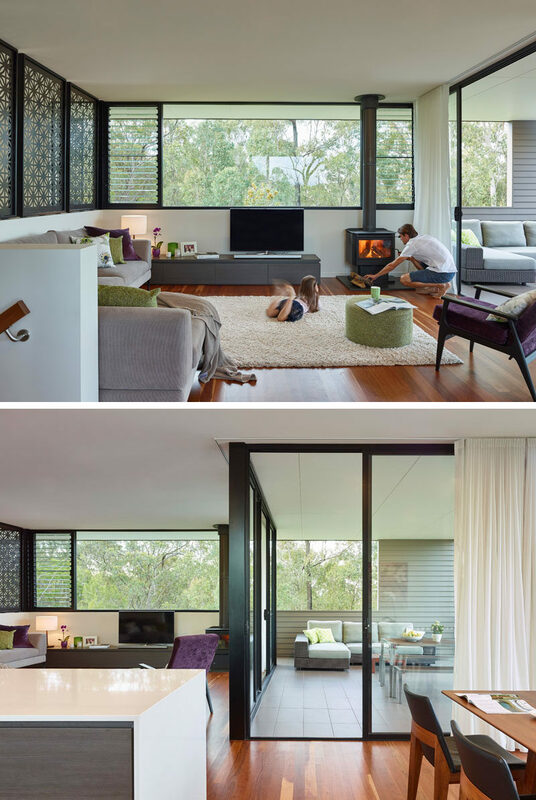 The decorative panels in the living room create continuity throughout the home. The living room is cozy and functional with a standalone fireplace, and looks out onto the yard below. The living room leads out to a covered patio with an outdoor dining table and couch, which provides more outside space for nature lovers. Moving from the balcony back inside, you are brought into the dining room which is simply decorated. The wood and black upholstered dining set compliments the rich wood flooring, while a pop of color is added to the dining area with a pink floral painting. Next to the dining room is the kitchen. White countertops help to reflect light and keep the kitchen bright and airy and the use of a kitchen island maximizes productivity and allows for extra seating in the kitchen. Next to kitchen in a hallway to the bathroom, is a small home office with a floating desk. 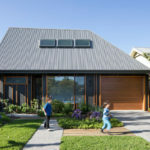 A combination of windows and louvers allows natural light to fill the space.